Abstract: In this month’s column, Kerry Hennigan looks at the song and video for Michael Jackson’s “Blood on the Dance Floor” which, when released in 1997, displayed a new, aggressive sound and sensual attitude for Jackson. She discusses the durability of its impact 21 years after it was released. Hennigan, Kerry. 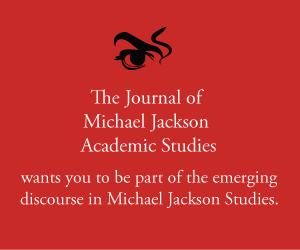 “MJ Studies Today XXXI (16-07-2018).” The Journal of Michael Jackson Academic Studies 5, no. 4 (2018). http://michaeljacksonstudies.org/mj-studies-today-xxxi/. It’s no secret to folks who know me as a Michael Jackson fan that I love “Blood on the Dance Floor” – the album, the single, the short film and, especially, the artist himself at this mature age and stage of his career. “Blood on the Dance Floor” is, indeed, a full-blooded assault on the senses, its impact enhanced by the short film that was created for the track. Jackson is famously said not to have liked the “Blood…” video because it did not tell a story. Yet, to this fan at least, it is obviously another of Jackson’s “femme fatale” pieces, with Suzie a woman of deadly reputation, on the prowl for her next “victim”. She flirts and teases, and Jackson responds, being drawn into the dance with her, risking a broken heart – or a knife in the back (figuratively or literally). “Blood on the Dance Floor” remains one of my favourite of Michael’s short films and comes from the decade that brought us so many memorable ones – for songs from the “Dangerous” and “HIStory…” albums, and not forgetting my favourite spook fest, “Michael Jackson’s Ghosts”. If there is a video capable of pushing up temperatures and quickening pulse rates, it’s “Blood on the Dance Floor”. For some of us, our unabashed enjoyment of the song and its short film hasn’t lessened, even twenty-one years on. Hennigan, Kerry, My personal notes from Brad Sundberg’s “In the Studio with Michael Jackson” seminar at Thriller Villa, Las Vegas, 10 October 2015, with guests Brad Buxer and Michael Prince. Hennigan, Kerry, My personal notes from Brad Sundberg’s “In the Studio with Michael Jackson” seminar.